With only a few more days to make a tax-deductible donation to The National WWII Museum in this calendar year, we wanted to take a moment to show you an example of what your contribution supports. On display here at the Museum is a letter written in December of 1944 by Marine 1st. Lt. Leonard Isacks, Jr. to his two young sons, explaining why he’s far away from home at war and not with them for Christmas. 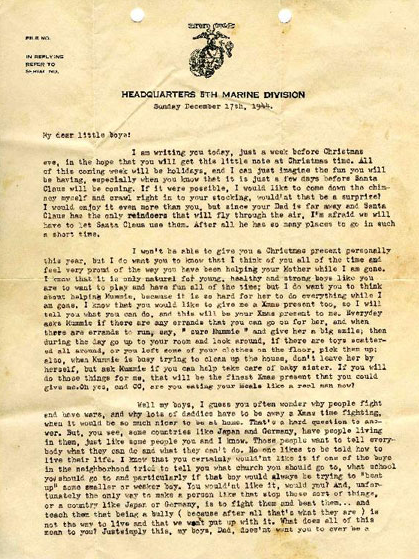 The letter, which you can read the full text of here, captures perfectly why more than 16 million Americans fought for freedom and why more than 400,000 willingly gave their lives in defense of liberty, including 1st Lt. Isacks who was killed on Iwo Jima two months after he wrote his sons. It also represents the heart of the Museum’s mission — to tell the story of WWII from the perspective of men like 1st Lt. Isacks, an ordinary citizen-soldier who left his young family to defend America and our freedom. We work each day to honor veterans like 1st Lt. Isacks and sustain the legacy of our nation’s WWII heroes to ensure all generations understand and appreciate the costly price of freedom.As we prepare for a new year here at the Museum, will you generously support our efforts with a contribution?